Coaster, 12 th December 1984, outward bound for who knows where? Marine art by Gordon Frickers 22 x 30 cms (9″ x 12″), oils, price £750, ex studio, ex frame. A fabulously study made on location of a moment that is already history, the departure of a coaster laden with China Clay, from Par Docks. Today the docks are closed (22.08.2017) fated to become a marina, their facinating history already fading, while a hint of the colour and airs of those days is caught by this unrepeatable spontanious painting. Inspiring, joyful view from what was for the 5 happiest years of my life seen from what was my kitchen window at Polmear Parc, Par. 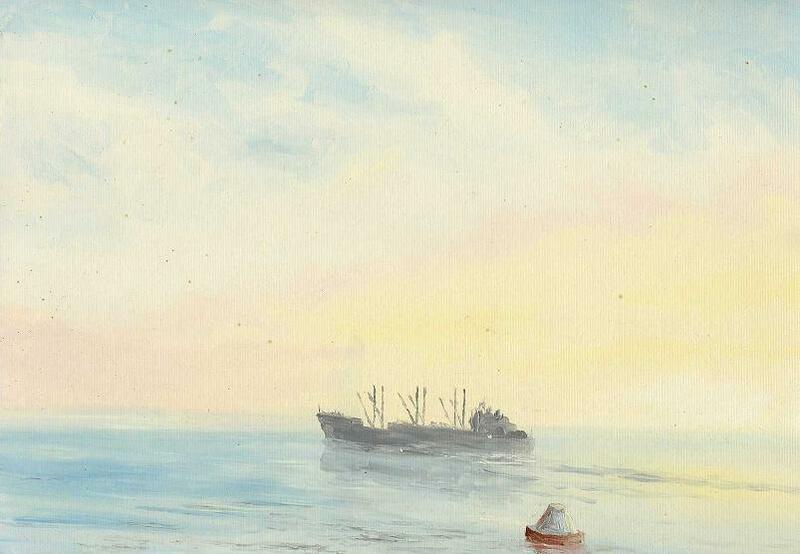 This early example of my marine painting started life as a page in a sketch book. It was one of a series much influenced by J M W Turner, painted spontaneously in early morning light enabling the artist to discover some of the colour and atmosphere of the Cornish coast. At the time I did not realise what a sensitive, special and valuable work I’d painted. One of my earlier paintings, I’m guilty of not trying to sell this one… it is ‘hidden’ in this web site archive, this very original marine painting has lived in a box with it’s fellows for 25 years, I should share the obvious warmth and happiness by letting it go to another home. That is surely part of what a painters work is for, to bring light and colour, communicate with others lives? A typical coaster in the China Clay trade making her early departure on a warm 12 th December 1984 morning. The artist lived for 5 years just behind Par beach and regrets he left there. The Cornish village of Par was when I lived there looked down upon by many as a poor unattractive place dusted with china clay. Par was a real working village with a long and strong sea link. Fishermen had for centuries worked off the beach. Small ships traded to Par which formally had a port were the stream still runs. Small ships were built on the beach before Par Docks was established for the China Clay trade. Par and nearby Tywardreath features in the book, ‘House on the Strand‘ by a famous author and playwright who lived nearby, Dame Daphne du Maurier, Lady Browning. ‘House on the Strand‘, a mysterious surprising read, was first published in 1969 by Victor Gollancz. The book was made into a film and the author featured in a BBC series. Du Maurier used to shop in our local store. The village of Par, Near St Austell, on the South Cornish Riviera was until recently very much a true Cornish working village with a long tradition of handling China Clay cargoes and repairing ships. Times change, the docks have closed, the Cornish men are out of work. The historic dock among other things inspired one of the Reverend Audrey’s ‘Thomas the Tank Engine‘ cult books is to become a marina. Audrey’s characters Bill and Ben whom Audrey wrote worked for the Sodor China Clay Company (episode 15 in the TV series), not to be confused with the two ‘Flower Pot Men’ of the same name, were based on two unique saddle tank engines who worked for the English China Clay Company. Their funnels set at 45 degrees so they could pass under a low bridge just outside Par Docks. Last time I passed through Par the old low bridge was still standing. The last British ships to set square sails and work without engines, the schooner Jane Banks and the more famous Brigantine Waterwitch (both pictures available from this web site as signed numbered Heritage prints) owned by Mr. Stephens of Fowey, were maintained at Par Docks as was all his fleet and finished their days at Par. When Mr. Stephens died in 1936 the pair, Jane Banks and Waterwitch were laid up on Par Beach for 2 years, slowly deteriorating, people thought they like so many others were finished, but not quite. Both were sold to a foreign flag so sailed on to end their days in the Baltic. I enjoyed many an early morning run on Par Beach….